A number of problems can arise when you have lost a tooth. It certainly affects your ability to bite and chew food. When a number of teeth are missing, you may loose confidence to eat hard food items. Did you know that there could be other complex oral problems from tooth loss? To counter such issues and to improve oral health many teeth restorations have been developed. With advancements in technology, these restorations are getting better day-by-day, serving the necessities of patients. Dental implants have been arguably one of the finest among replacements for lost teeth. With the implants being made out of biocompatible material, well-maintained implanted teeth can last for the entire-life of the patient. Are you suffering from teeth loss? Make an appointment with our dentist in Yorba Linda, California to get a fair idea on how dental implants can help you regain a healthy smile. There can be a number of reasons for teeth loss. Gum infection, teeth decay, aging and trauma are some of the most commonly known causes of teeth loss. Losing a tooth can firstly create a sense of discomfort to bite and chew food. With time, the teeth nearby tend to shift positions moving towards the gap. This takes place because of imbalance in the dentition created from tooth loss. The gap in the dentition attracts food particles. Food lodgment in this gap can increase the chances of Gum infection . Bone resorption is another phenomenon which takes place when there are a few teeth missing in a row. This causes the skin to sag and makes the patient look old. Dental implants are the only teeth restoration which can address all these problems. Once in place, the implant can finely increase the chewing efficiency and protect the supporting bone. Just about anyone can get a dental implant surgery as long as he/she has healthy supporting bone. The procedure is performed with the help of local anesthesia. The restoration process takes place in two steps. The first phase is where the dentist surgically places the implant in the jawbone. A small incision is made in the gums and our dentist in Yorba Linda uses different types of drills to create a bony recess. The implant is carefully torqued in the jawbone according to planned position. The gums are sutured back and left to heal. During the healing period, the implant integrates with the jawbone. The dentist takes the impression of the implant post and other teeth to get the dental crown fabricated in the lab. The crown is commonly made of porcelain to replicate the appearance of natural tooth. 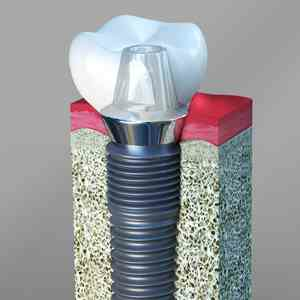 An abutment is fixed over the implant and the crown is cemented over it. Once in place, our dentist explains patients about maintaining good oral hygiene. Proper care can ensure that the implanted tooth lasts longer. Most Commonly Asked Questions About Dental Implants? Any person who has lost a tooth can get dental implants. Apart from patients with few health concerns such as poorly controlled diabetes and patients who are undergoing radiation therapy for cancer in head and neck region, any person can get dental implants as long as his/her supporting bone is healthy enough to hold the restoration. A bone grafting procedure may be suggested if the supporting bone does not have sufficient volume. The metal which is used in dental implant, does it affect to our body? No, absolutely not. We are using Titanium and zirconium Both materials can integrate with the bone. Titanium has biocompatibility, ossify as human bone over time, very lighter material, prevents irritation towards hot or cold food. So you may not feel any other side effects rather you may feel as a natural tooth. Does the implanted tooth gives different taste for food? No, neutral taste you may feel. Under no circumstances you get metallic taste because of implanted tooth/teeth. Can cavity occur to implanted tooth? No, cavities wont occur to a implant-restored tooth/teeth but you need to take care of gums helath. Consult dentist to look after your gums and oral clean up to be safe from oral disease.